Dr. Charles Callahan earned his medical degree from the College of Medicine at the University of South Florida in Tampa, Florida. There, he also performed his internship and residency in Internal Medicine, followed by a fellowship in Infectious Diseases. 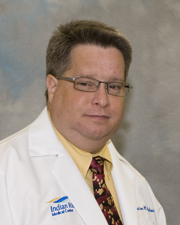 Prior to joining Indian River Medical Center, Dr. Callahan was affiliated with several hospitals, including James A. Haley Veterans Administration Medical Center, Vencor Central and Sebastian River Medical Center. He is board certified in Infectious Disease Medicine.